We all know sugar isn’t good for us. Exactly how it negatively impacts our health is slightly more intriguing. It is important to understand how sugar affects our body, in order to encourage us to reduce our sugar intake. Click here for practical tips on how to stick to a lower-sugar diet. Before we explore the negative effects of sugar, let’s discuss what it actually is. Sugar is the simplest form of carbohydrate. Glucose (e.g. from broken down starches like bread and pasta), fructose (fruit) and sucrose (table sugar, a combination of glucose and fructose) are all different types of sugar. All sugar results in similar negative effects when over-consumed. However, there are differences in how sugars are processed by our body. Glucose metabolism occurs within all cells throughout the body, whereas fructose is metabolised in the liver. The evidence is mixed, but some research suggests that, in the long-term, fructose has worse effects on our health than glucose. The idea is that fructose metabolism promotes visceral fat (fat around your organs), which has been linked to increased risk of type 2 diabetes and heart disease. However, there is not enough robust evidence to suggest that fructose specifically is worse for you than other sugars. Some evidence suggests the effects of fructose are down to eating too much overall, not fructose per se. Many foods that are sweetened with high-fructose corn syrup are easy to over-consume, for example, soft drinks. Trying to decide which type of sugar to avoid is a case of finding the lesser of two evils. At the end of the day, sugar is sugar! Now, on to how it can negatively impact our health. Type 2 diabetes is characterised by high blood sugar. There are many potential answers to the question of what causes diabetes. The uncertainty stems from whether weight gain results in insulin resistance (where our body does not respond to insulin), or vice versa. The answer to this question determines how you treat individuals with type 2 diabetes or ‘pre-diabetes’ (impaired glucose regulation). How our body responds when we eat a high sugar meal. Professor Taylor, a professor of medicine and metabolism at the University of Newcastle, suggests that the first step of diabetes is eating too much food, carbs in particular. This leads to some weight gain, or slight insulin resistance, which develops into a self-perpetuating cycle. Sugars promote the accumulation of fat around the liver, as excess carbohydrate is converted into fat to be stored in the liver. By this theory, sugar increases both weight gain and insulin resistance, leading down the path to type 2 diabetes. Another theory of how diabetes develops is supported by Dr Peter Attia – a surgeon from the US who developed pre-diabetes many years ago and successfully reversed the condition. This theory draws upon the facts that: a) refined grains and starches elevate blood sugar in the short-term, and b) some evidence suggests that sugar directly leads to type 2 diabetes. 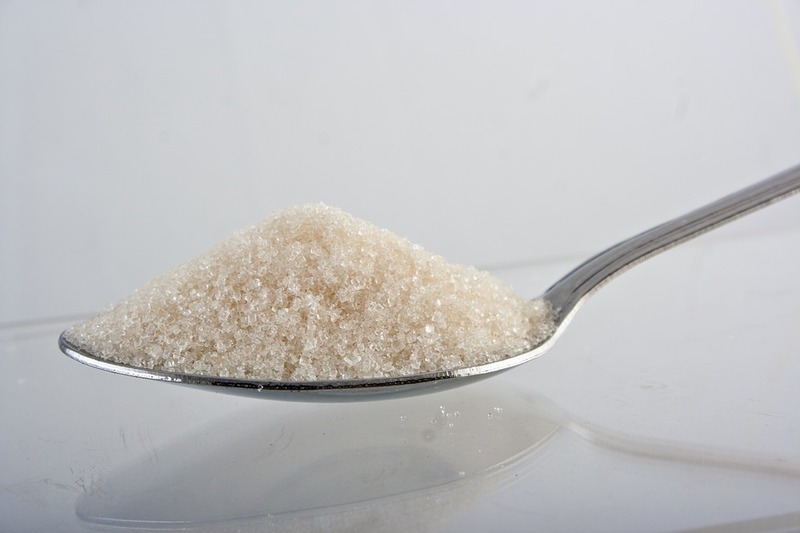 According to Dr Attia, sugar causes diabetes via insulin resistance rather than weight gain. This could explain how lean people can still develop type 2 diabetes. A slightly different angle on the matter is presented by Professor Rodger Unger, who suggests glucagon action is crucial to the development of type 2 diabetes. 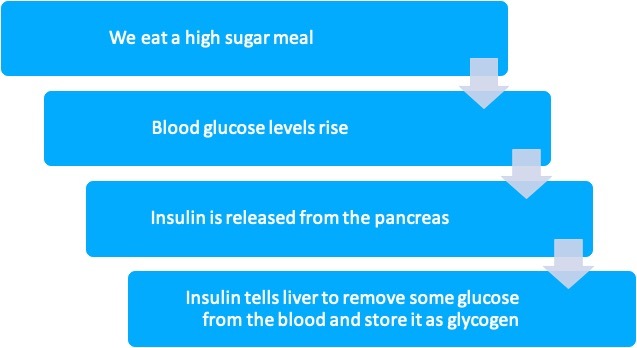 Glucagon tells the liver to release stored glucose into the blood. In a healthy person, overeating leads to spikes in insulin and suppressed glucagon. This process results in normal blood glucose levels. Type 2 diabetics do not have the same response, and as a result, have chronically elevated blood sugar. Professor Unger proposes that high levels of insulin in the blood from overeating (i.e. weight gain) is the first step on the track to type 2 diabetes. By this theory, sugar raises blood sugar in the short-term, and this increases insulin secretion, directly leading to diabetes. Dr Malcom Kendrick highlights two examples of people who don’t fit the model of more body fat means a higher risk of diabetes. Sumo wrestlers (incredibly fat) exhibit few cases of diabetes, whereas 100% of people with Beradinelli-Siep lipodystrophy (they have almost no fat cells) have diabetes. Dr Kendrick proposes if there is somewhere for the excess energy to go then insulin and blood sugar levels will not rocket. For sumo wrestlers, excess energy is burnt up from intensive training, whereas people with Beradinelli-Siep lipodystrophy have no fat cells to store excess energy, despite high insulin levels. This leads to insulin resistance. According to Dr Kendrick, eating too much sugar forces our bodies to produce lots of insulin and store fat (weight gain), then insulin resistance develops to block further weight gain. Yet again – sugar is at the core of the problem. As each of these theories suggests, excess carb consumption seems to be one a fundamental factor involved in the development of type 2 diabetes. This is seemingly easy to address by reducing dietary intake of sugar and highly-processed carbohydrates. There are many different theories of what causes type 2 diabetes. A common theme in all the theories is dietary sugar. Restricting our intake of highly-processed carbohydrates is the best way to address this. Ever felt an overpowering need to be horizontal after eating a large pizza? We have all been there. As we have discussed, eating refined carbs causes a dramatic spike in blood sugar and a resulting rush of insulin to counter the spike. Following this, blood glucose levels drop and our energy levels crash. Research suggests that the neurotransmitter (a chemical messenger) orexin plays a role. A lack of orexin leads to narcolepsy (a brain disorder that causes people to suddenly fall asleep) in humans and animals. This suggests it is heavily involved in keeping us feeling awake. Glucose actually inhibits the action of orexin. Now, this doesn’t mean we pass out whenever we eat carbs/ sugar, as some orexin cells measure changes in energy whilst others maintain arousal. But it could explain why we feel sluggish after digesting refined carbs. Interestingly, proteins have the opposite effect and stimulate the action of orexin. In addition, when we feel tired we tend to want carbs/ sugar more. So eating too much sugar could lead to a positively reinforcing cycle of eating carbs, feeling tired and craving more carbs! Eating refined carbs causes dramatic fluctuations in blood sugar and hence energy crashes. The neurotransmitter orexin, which is inhibited by glucose, may play a role. Feeling tired increases our desire for sugar, promoting a vicious cycle. Alzheimer’s disease is the most common form of dementia here in the U.K. It is characterized by an ongoing decline of cognitive function that affects memory, thinking skills and other mental abilities. Recently, Alzheimer’s has been referred to as ‘type 3 diabetes’ or a brain form of diabetes. This is because the pathophysiology of Alzheimer’s exhibits similarities to that of diabetes, which could mean that sugar plays a role in its development. There is a staggering link between Alzheimer’s and type 2 diabetes. Those with type 2 diabetes are at least twice as likely to develop Alzheimer’s compared with healthy people. This by no means implies causation but demonstrates considerable overlap between the two conditions. Dr Suzanne De La Monte, who pioneered the idea of Alzheimer’s disease being ‘type 3 diabetes’, wrote a comprehensive review on the topic. Dr De La Monte highlighted that the brain needs insulin for many reasons, including taking up glucose for energy, producing neurotransmitters and stimulating functions needed to make new memories. In Alzheimer’s, the brain is not very sensitive to insulin and so it struggles to take up sugar from the blood, resulting in brain cells starving to death. So it seems the brain becomes insulin resistant in Alzheimer’s. Here we can see a common theme with type 2 diabetes. If Alzheimer’s is ‘type 3 diabetes’ then a diet aimed at managing diabetes should equally prevent, or slow the progression of, Alzheimer’s. Namely a low-sugar/ low-carb diet. Alzheimer’s disease is sometimes referred to as ‘type 3 diabetes’. Individuals with type 2 diabetes are twice as likely to get Alzheimer’s disease. In Alzheimer’s, the brain becomes insulin resistant, leading to brain cell death. A low-sugar diet could slow the progression of Alzheimer’s. These recommendations are built upon observational evidence that noted an association between saturated fat and heart disease. However, these studies do not establish causation but rather point towards a trend. Additionally, many of these studies base their conclusions on markers of heart disease, such as signs of inflammation in the body, rather than hard endpoints, such as heart disease mortality. There is equal observational evidence suggesting that sugar, rather than fat, is strongly associated with the hard endpoint of death from heart disease. On top of this, type 2 diabetes is a significant risk factor for heart disease, which suggests sugar plays a part. Dr Malcom Kendrick proposes a different way that sugar increases heart disease risk. In his 62-part blog series, he examines in detail what causes heart disease. In the piece focusing on diabetes, he notes a gap in the explanation for the increased risk of cardiovascular disease (CVD) in diabetes. In diabetes, conventional risk factors for heart disease, such as blood pressure, are raised, yet most other ‘traditional’ risk factors are unchanged. So this begs the question: what causes the increased risk of CVD with type 2 diabetes? How does high blood sugar cause it’s damage? Answering these questions, Dr Kendrick introduces the glycocalyx. This is a slippery, slimy layer inside our blood vessels, lining our endothelial cells that, under a powerful microscope, looks like a billion tiny hairs. The ‘hairs’ are long strands of proteins and sugars bound together. Their function – many! But mainly to protect the underlying endothelium from damage and prevent blood clotting. Research, published by the American Diabetes Association, suggests that high blood sugar significantly reduces glycocalyx volume and results in endothelial damage, as well as reduces its ability to prevent blood clotting. In this way, diabetes (or high blood sugar) increases the risk of heart disease by damaging the glycocalyx, leading to damaged endothelium and an increase in blood clot risk. Sugar significantly spikes our blood glucose levels in the short-term. By Dr Kenrick’s theory, too much sugar directly leads to heart disease by damaging the glycocalyx. Sugar has been associated with heart disease. Type 2 diabetes is a significant risk factor for heart disease. Dr Malcom Kendrick suggests sugar directly increases the risk for heart disease by harming the layer inside our blood vessels called the glycocalyx. If it is difficult to resist cravings for sweet foods when they arise. Even when we know we should avoid that 4 p.m. chocolate bar – the desire is sometimes overwhelming. The paradox is that eating sugar makes you crave more sugar! A potential reason for this is that tasting something sweet leads to the activation of pleasure-generating brain circuitry. Animal studies demonstrate that rats who are fed sugar for intermittent periods show signs of addiction and dependence on the sweet stuff. However, this study restricted access to sugar to small windows, which could explain why rats appeared dependent. Studies that give access to sugar around the clock show fewer addictive behaviours in animals. In addition, you get the same effect with rats if you use an artificial sweetener instead of sugar. This suggests that sugar cravings are about the taste rather than the sugar itself. Supporting this idea, research in humans suggests that increased tasting of sweet flavour increases preference for sweet foods and subjective pleasure gained from those foods. For this reason, artificially sweetened foods are not a great alternative to sweet treats as they still increase our preference for sweet tastes. So eating more sugar makes us develop a preference for sweet foods and leads us to crave these foods more. Another reason to cut down on sugar. Animal studies show that rats fed sugar show signs of dependence. Human studies suggest that increasing the amount we taste sweet food increases our preference for sweet foods. Artificial sweeteners still taste sweet so are not the best alternative! Acne is a common frustrating skin condition. Research has explored links between acne and diet. In the past, dairy was under fire. The proposed mechanism is that dairy increases the levels of the hormone IGF-1 (insulin-like growth factor). IGF-1 may contribute to sebum production and inflammation, which is implicated with acne. Interestingly, skimmed milk was highlighted as more of an issue for acne than whole milk. The suggestion is that the processing skimmed milk undergoes increases the availability of the factors that are implicated with acne and milk, plus the fact the skimmed milk has less oestrogen (a hormone thought to reduce acne). However, all the evidence implicating dairy with acne is weak. The majority of the evidence is based on self-reports of food intake and acne severity, which are unreliable. Additionally, most of the studies are observational, so causation cannot be inferred. Emerging data suggests that a link between blood sugar levels and acne is much more likely. An intervention trial, published by the American Journal of Clinical Nutrition, demonstrated that a low glycaemic index (GI) diet improved acne in young males. The potential explanation of this is that refined grains with a high GI, such as white bread and pasta, are rapidly absorbed into the bloodstream. As discussed earlier, this raises blood glucose levels and insulin is released to counter this. Having high levels of insulin in the blood has been implicated in the development of acne as it elevates IGF-1 levels. Harley street consultant dermatologist Dr Anjali Mahto advises that “the link between acne and dairy is much weaker than the link with sugar”. Dr Mahto suggests that for some individuals, skin may benefit from limiting refined carbs with a high GI, such as white rice and white bread. She adds that a diet that is healthy for you, is healthy for your skin, so reducing sugary, refined foods certainly can’t hurt. Dairy was previously associated with acne, but the evidence is weak. Some evidence suggests that a link between blood sugar and acne is more likely. Reducing refined, high GI carbohydrates helps to prevent blood sugar spikes, which may benefit the skin. It is common knowledge that sugar is bad for our teeth. The actual science behind how is more interesting. In the evidence base used to inform dentists, it explains how dental caries (fillings/ tooth decay) occur. The metabolism of sugars from our diet produces organic acids, which demineralise tooth enamel. Saliva in our mouth promotes remineralisation. Given enough time, the enamel can be completely re-mineralised. However, if we consume sugar too frequently then there is too much acid available and de-mineralisation dominates. This makes our teeth more vulnerable to tooth decay. So, it seems that we should moderate how frequently we eat high-sugar foods. If we leave larger gaps in-between sugar consumption, then our mouths have a chance to re-mineralise. What about the amount of sugar we consume at a given time? A thorough review examining the relationship between the amount of sugar consumed and dental caries demonstrated that dental caries is less frequent when added sugar is below 10% of energy intake. Some evidence suggested that limiting added sugar to less than 5% has even more of a benefit. Dietary sugar produces acids that demineralise our tooth enamel. Leaving longer gaps between sugary food consumption allows saliva to remineralise the mouth. Tooth decay is less frequent in diets with less than 10% added sugar, and much less frequent in diets with less than 5% added sugar. Increasing our risk of type 2 diabetes, heart disease, and Alzheimer’s disease. Promoting cravings for sweet food. As refined, high-sugar foods usually provide little nutritional value, the best advice is to avoid them when possible! When consuming carbohydrates, it is best to opt for whole food options, such as rye bread, oats or sweet potato. These won’t spike your blood sugar as much as refined options, such as white bread or sugary cereals, and will leave you feeling fuller for longer. If you are struggling to implement a healthier, low-sugar diet into your routine, give OurPath a go. The OurPath programme helps people lose weight and change their behaviours to live a healthier, happier life. OurPath recipes are lower carb and low-sugar. Your qualified health coach supports you every step of the way and tailors the programme to suit your needs. Take our health quiz here to find out more.